On Ustream last Saturday night, I colored this page while fans were able to watch online and ask questions. I recorded the process in two parts. The first part is me going through the process of 'flatting' the page. The second part is where I get into rendering a panel and talking about photoshop brushes, shading, and texturing. Both parts are available to watch anytime: http://www.ustream.tv/channel/davidpetersen (though they are both long and don't expect many folks to sit through them, but posted them at the request of fans who couldn't make it on Saturday). Because I stopped the recording after I finished the one panel, I wanted to show you all the final colors on the page. 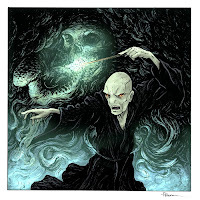 The awesome Craig Rousseau and I decided to do a trade for Harry Potter pieces. He requested Dumbledore & Voldemort fighting. I found it hard to get both posed where you could see their faces, so I opted to just do two pieces for him. I got these inked and off to Craig a while back, but wanted to splash some color on them before I shared them. 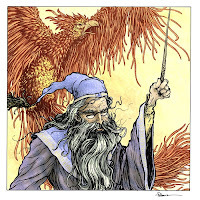 Craig and I are both big fans of the books and found that we both listen and relisten to the Jim Dale audio books while we work (as does Katie Cook and Jeremy Bastian). I'm currently on book 5 (again) in my umpteenth listen through the series. This Saturday (1-30-10 at 7:00pm) is Ink & Stein at the Corner Brewery in Ypsilanti, MI. It's a gathering of local artists and writers to get together and talk and work side by side. There had been some thought of moving the venue for this month, but that may get tested out in the months to come, so if you are in the area, stop by and bring a sketch pad. If you are not in the area, try starting up an Ink & Stein of your own where you live. Getting out of your workspace and talking to other artists is a good exercise! Muppet Peter Pan #4 will be out later this week (Thursday the 21st due to the holiday). I wanted to share the process steps in this cover (I have doe this with other pieces, for the blog, so the steps should be familiar). I had been given an outline of what happens in each issue from Boom with a note from editor Aaron Sparrow saying "Captain Gonzo kidnaps the children would make a good 4th cover". I sketched out ideas in my sketchbook. In the upper right you can see my rough thumbnail for the layout. 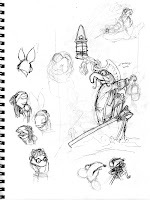 Once that layout idea worked, I started sketching out the various characters. Gonzo was first since I knew he would be most prominent, and then I drew the other Muppets a few times until I got something I liked. I work this way so that if I draw say Gonzo, right on the first try, I don't have to worry about messing up that part of the drawing when I get to the next character and it doesn't work out. I scanned the page from my sketchbooks and cut and paste each character onto their own layers in a new document the size of the cover art. I tinted each character to help me keep track of what lines belong to whom. In this stage I can tighten up the layout. I can move or rotate characters slightly. I can resize parts of them that are out of proportion (either to themselves or with each other). This digital layout of my drawings helps me finalize the image before inking it and without doing much, if any, redrawing. I print out my photoshop layout and use a light box so that I can see the rough through the bristol paper stock I ink the cover onto. In this inking stage I focus on line quality and texture. That the contour lines of Bean Bunny look like fur and that Scooter's hair looks like yarn. I also like adding patterns that I will use a color hold on when I color the image, like the stripes on Rizzo's shirt or the embroidery on Gonzo's coat or the lace pattern in his cuff. Monday night I streamed for four hours while I inked a Mouse Guard page. The session was recorded, but Ustream caps recordings at 2.5 hours. I want to say that I don't think people would want to watch the long stream after the fact, but I had requests for it. I did my best to verbalize the questions asked in the chat before I answered them so later viewers can still benefit from the Q&A that goes on in my streams. I plan on coloring this page on Saturday and streaming it live. Follow me on Twitter or Facebook for updates on the time of the stream. I have my degree in printmaking, and I feel that the process and techniques I learned from printmaking really influences how I draw today. I wanted to show how one of my favorite processes: etching, is done and how the quality of line and tone influenced Mouse Guard. I'll be using this etching I did in college of Jim Henson as an example along with diagrams that represent cross-sections of the process at a microscopic level. 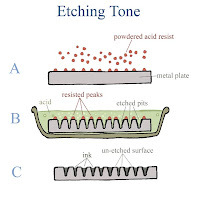 Line: (A): Etching is done by taking a metal plate (I used zinc) and coating it with an acid resist (these can vary depending on the desired effect, but that's not important for this overview). 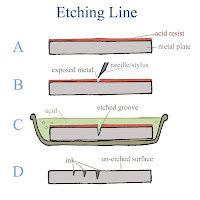 (B): Then the resist is lightly scraped away with a stylus or needle when an image is drawn on the surface of the plate so that the metal is exposed in the areas where the lines will be. (C): The plate is placed in acid and the acid will only etch a groove into the areas that are exposed. The longer the plate is in the acid, the deeper the groove becomes. (D): When the image is finished the acid and resist are removed and the plate is wiped with ink. The deeper etched lines fill with more ink, making them darker than the shallower etched lines. The surface of the plate is smooth and the ink wipes off clean. When run through a press, the ink transfers to paper for a finished print. 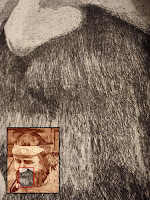 This zoom-in of my Jim Henson print shows how his beard is made up of lots of overlapping etched lines. 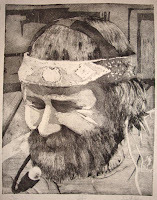 Tone: (A): Instead of coating the entire surface of the plate, you can dust the surface with a powdered acid resist (this is traditionally called and Aquatint). (B): When placed in the acid, the tiny 'dots' of resist protect very small areas of the surface and allow lots of pits to be formed all around the protected peaks. (C): The ink wiped into and filling up the pits and wiped clean from the surface creates an area that has thousands of tiny white 'dots' in a field of ink filled pits. The surface would feel similar to sandpaper and depending on how deep the etch is, the darker it becomes. The backgrounds of the Jim Henson print as well as a lot of his facial tone was done with this process. You can see that depending on how evenly the resist goes on, you can get rougher or smoother results. Printmaking forced me to think about the kind of lines or tones or patterns I wanted to make long before I made them. I had to prepare my zinc plates in advance for what process I was going to do first, and second, and third, and so on. Etched lines can be used for tone by overlapping them. 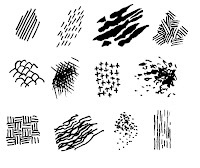 Patterns can be formed with repeating line structures or careful application of acid resist. 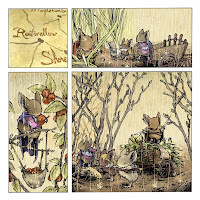 In this same way I now think about line and pattern and tone when I'm inking Mouse Guard. 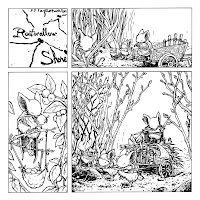 cross-hatching is like lots of etched lines, stippling is like an aquatint, etc. Though he has never done any etching, Jeremy Bastian is a natural fit for this post. He has the sense of line and use of line to create texture and tone, and the patience and methodical nature that a good illustrative printmaker needs. This gem he gave to me over the holidays. I left it at 150 dpi so that you could still see the detail. 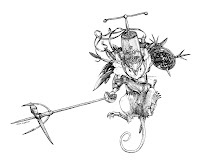 The mouse from hat ornament down to curl of tail is only 4.25". Wow! Thanks Jeremy! Joe over at Toughpigs.com a Muppet fan-site was kind enough to do an interview with me about my Muppet Covers for Boom. You can read the interview here. I'm really glad to have the privilege to do these covers and having the fans enjoying them makes me happy. Muppet fans are not the easiest to please, so I'm glad that the response to my work has been positive. I did a quick glimpse of this on Twitter a while back, but wanted to give you some better images. This is certainly the biggest and most complex model I have made to-date. It's the interior of the June Alley Inn. It will be featured heavily in the Anthology series Legends of the Guard, so to make my life easier I took some time (a full day and night) to build this from scratch. 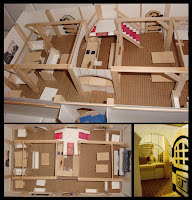 The materials are bristol board and balsa wood. The stairs would lead up to the rooms, the two doors on the rear lead to the kitchens. There is a staircase behind the bar (under the staircase) that leads to the cellar for drink storage. A childhood friend of mine and I reconnected on Facebook. 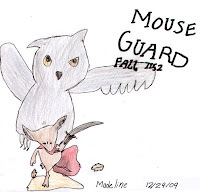 His daughter Madeline LaVere did this drawing for me when she and her dad and her younger brother came over to visit and see where Mouse Guard is drawn. So it was wonderful visiting with an old friend and getting to meet his budding artist of a daughter.